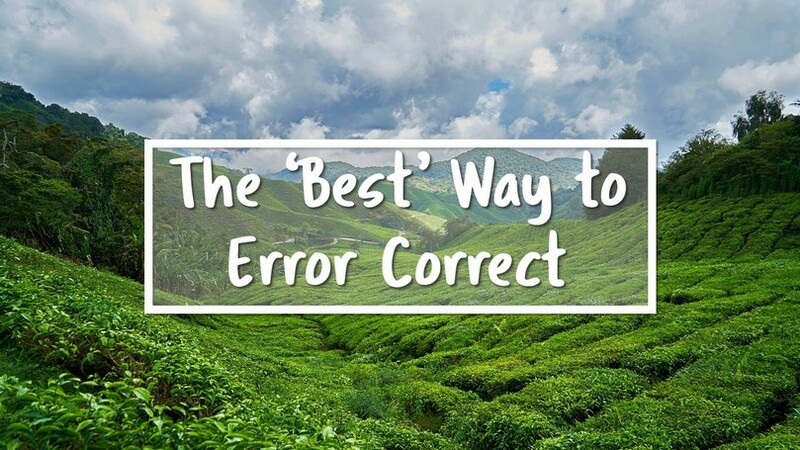 The best error correction has three elements. Timeliness – it happens as close to the error occurring as possible. Reformulation. The student has a chance to try again until correct. Correct as close to the error occurring as possible. The dilemma happens when students are in the middle of a dialogue. Do you interrupt to correct them and risk derailing the conversation? Or correct later when it’s less effective? Or write down general class errors and do a review at the end that covers 'most' of them? The correction is tailored to the student’s individual error, rather than giving generic whole class feedback (students never think general advice applies to them). How do you find the time to do this for every student though? The student has a chance to try again until they get it correct. Which is fine for confident students, but the pressure of having others waiting for you to correct yourself can destroy confidence - especially when a student is trying to scan what they've just said for an unknown error. It’s great because it addresses all three elements. Make an agreement with your students that every time they make a specific mistake (e.g. they use the present simple instead of the past simple) you’ll tap your pen twice on the desk. They should then correct themselves, and continue. Non verbal correction is immediate. It’s personalized. It gives structure to quickly correct their mistakes quickly (i.e. students don’t spend time scanning for an ‘unknown’ mistake). Any specific language point you’re focusing on. Grammar is good, as is pronunciation. What other types of correction do you find particularly useful with your students?